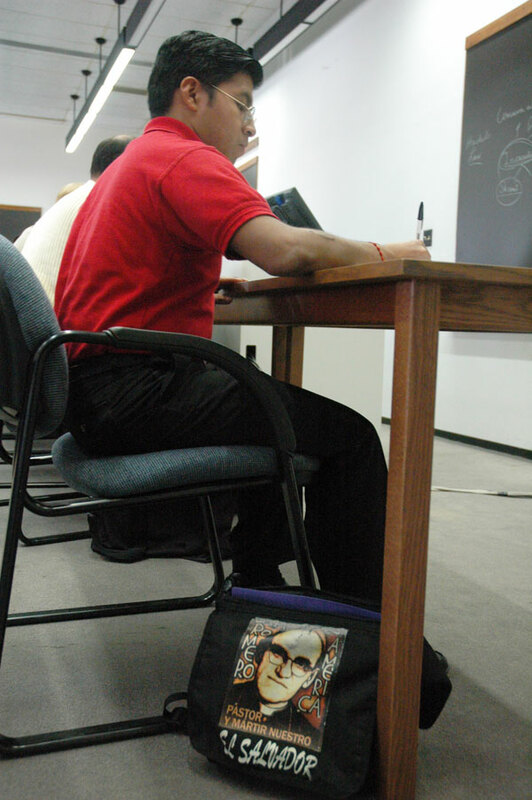 As he walks the halls of Saint Meinrad School of Theology in St. Meinrad, seminarian Oscar Vasquez carries a book bag that reminds him of the hero who serves as an inspiration for his life—and his desire to become a priest. The image on the book bag depicts Archbishop Oscar Romero, the bespectacled, balding Church leader in El Salvador whose vocal support of the poor and human rights caused him to be assassinated in 1980 as he celebrated Mass. “My vocation became stronger when I read about his life and his work,” says the 30-year-old Vasquez, who was a toddler in El Salvador when Archbishop Romero was shot and killed during that country’s civil war. It’s an approach that Vasquez has adopted, an approach that helps to explain the unusual journey that has led him from El Salvador to a seminary in southern Indiana. His faith journey began as a teenager when he was part of a youth group at his parish in San Salvador. As the years passed, he led the youth group and also directed several mission trips. During those years, Vasquez met Father Kenneth Davis, a member of the Conventual Franciscan Province of Our Lady of Consolation based at Mount St. Francis in the New Albany Deanery, who was serving in El Salvador. Father Kenneth asked him if he had thought about becoming a priest, but Vasquez didn’t feel called at that point in his life. Instead, he went to college then worked as a supervisor in a company for more than three years. Vasquez prayed. This time, he heard God’s call. Vasquez came to the United States in 2005, finding a spiritual home at St. Mary Parish in Indianapolis. Vasquez has been a blessing for St. Mary Parish, says its pastor, Father Michael O’Mara. Since August, Vasquez has been trying to make a new home at Saint Meinrad School of Theology. He talks again about his life “being in the hands of God.” Then he adds a twist to that phrase, a twist that gives a hint of the future he sees for himself.